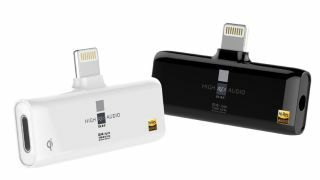 Res is a hi-res DAC with headphone jack for iPhone 7 | What Hi-Fi? Res gets around the iPhone 7's lack of headphone jack by adding one in, along with another Lightning port for charging your phone at the same time. Apple risked the ire of music fans everywhere when it announced the iPhone 7 would not feature a 3.5mm headphone jack. Sure, you can use a pair of Lightning port-compatible headphones, but what about listening to music while charging your phone? That's where this Kickstarter project comes in. Called Res, it's basically an adapter for the iPhone that adds a 3.5mm headphone jack as well as another Lightning port. Inside the adapter is a DAC that will upscale tunes to 24-bit/192kHz. It also doubles as a Qi wireless charger. In other words, you can listen to hi-res music using your existing headphones while charging your iPhone, either wirelessly or with a Lightning cable. This will be a blessing for anyone who doesn't want to replace their high-end headphones with a new Bluetooth or Lightning pair. With a growing number of Android phones following Apple's lead and ditching the headphone jack, there are also USB-C and microUSB versions of Res. It means sticking an adapter into your phone, sure, which is far from a perfect solution, but it may well be the best available at the moment.